HOW THE PASSION OF A FEW SHOWED THE WAY FOR THE DEVELOPMENT OF CYMBIDIUM INTEREST AND CULTURE THROUGHOUT THE WORLD. Wars change the course of history in practically all human activities. World War II raged throughout Europe and the world from September of 1939 to September of 1945. Nothing was normal. In England and Europe, the centers of the orchid world, the greenhouses’ of growers were being destroyed: one German bomb destroyed the nursery of Sladden in Belgium. The government in England was saying ‘plant food’. Literally, growers could only sell the plants or lose them. With World War II, the center of the orchid world moved to America. With it the post World War II orchid world, we knew and know was born. In the years during and following the war Americans discovered orchids with a passion, Perhaps it was the ‘era of the corsage’, all the women wore them, but it carried on to a love of orchids. It is an interesting story; however, the Cymbidium Society must be our focus. With the war, and in the years immediately following, a group of gardening enthusiasts in Southern California discovered Cymbidiums. Some had been planted outdoors on the estate of Henry Huntington in San Marino by William Hertrich the superintendent, which did well. 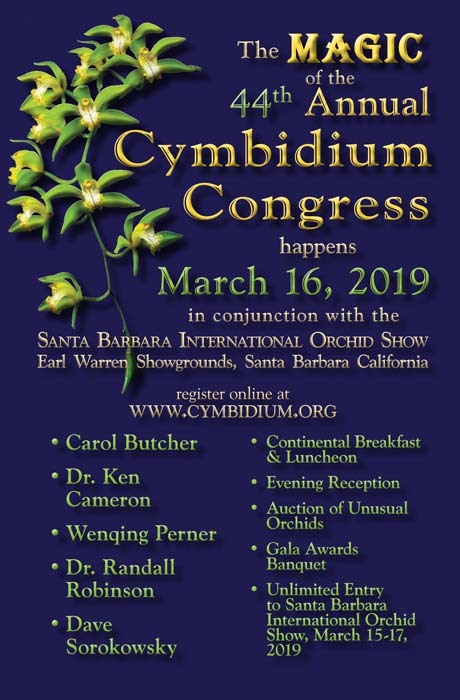 The story can best be told of the founding of the Cymbidium Society by quoting Jack Hudlow, one of the founders who spoke in 1966 at a meeting of the Society it Pasadena, California. What is of special interest is members were issued membership cards and four guest cards. For many years, entrance to the meetings was by invitation, guest cards, only. In September of 1946, the first official Bulletin of the society was published. It was printed on a large sheet that was folded for mailing. Dave McLean published that issue. Robert Casamajor was then appointed editor of the new publication. His comments on being appointed are historically interesting. “Over my strong protest and prostrate body your directors appointed this writer to serve as editor of the Bulletin. They were duly warned they might live to regret it, but they rushed in anyhow, so here we are.” Casamajor did a splendid and dedicated job. He remained as editor until his death. Right from the start the magazine was an important source of information and central to the society. Frank Fordyce, former society president then named former presidents of the society to 1966. Their naming for an historical record is of value. Their exact year of office is not listed. Dr. Dave W. McLean, John A. Hudlow, Glen Hiatt, J.C. Wright, Thor Peterson, John Chadwick, Edwin L. Reed, Joe Hampton, Gordon Sawyer, Frank Fordyce, Harold Cooper. As an epilogue to the story of the founding and early years of the Cymbidium Society, it is important to understand why everything was so favorable to the birth of interest and growth of Cymbidiums in Southern California. Clearly, climate was and is perfect for their culture. This is understood. Seldom remembered is that there were a number of ‘private growers’, especially in the Santa Barbara area who had grown Cymbidiums on their estates for many years before World War II. The firm of Armacost and Royston in West Los Angeles also had many thousands of pre-war Cymbidiums planted in the ground under lath, which they had imported from English growers. Such names in Santa Barbara as Dickinson, Carpentier, Bryce, Everett, and Rogers were prime sources of plants in the frantic post-war years. Elliot Rogers must be first remembered. For years before the war, he imported fine varieties from the leading English growers. The cultivar name he used for his best varieties was ‘Glendessary.’ Cymbidium Carisona ‘Glendessary’, one of the parents of Cymbidium Lillian Stewart is one of the world’s most influential parents. When Cymbidium fever swept the country, it was to those who had. Cymbidiums that the tide of interest went. When the Cymbidium Society was formed little was known about their culture. There were a score of questions to be answered and they burned in the minds of those who ran the Society. Every word of the Cymbidium News was avidly read to find the answers. “What makes a Cymbidium plant flower? What do you grow them in?” No, not what they came in from England and Belgium. “Leaf mold, peat, osmunda, compost?” “Virus?” “Never heard of it!” Aseptic technique, flaming. All questions to be answered and things to be discovered. The orchid world has changed and the Cymbidium Society led the way. That growers in other parts of the world had the same interests and questions is true. Perhaps their story has also been told. Lastly, as part of the post-war Cymbidium fever, we must look back in history to the tulip craze in Holland centuries ago. In Southern California, thousands of dollars would be paid for one Cymbidium plant; auctions were held and single bulbs were eagerly sought. Flowers sold at wholesale for two to three dollars. One amateur grower put his daughter through college with the sale of flowers from several divisions of one plant. Now, in a saner world, Cymbidiums are for everyone and they are perhaps the orchid world’s most popular cut flower. From any perspective, Cymbidiums have come from an ugly duckling to a regal queen.